An ABC News poll now shows only 37 percent of those polled support a repeal and replace strategy for ObamaCare. As the current poll shows, more Americans would prefer fixing the existing ACA than to tear it down and start over. 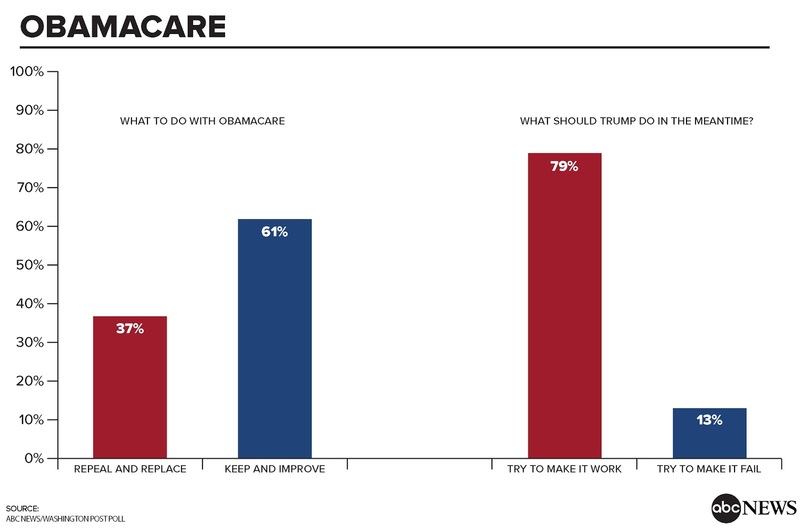 61% favor an effort to keep and improve ObamaCare. 79% favor trying to make it work versus 13% for trying to make it fail. Just 37 percent of Americans in the national survey say Obamacare should be repealed and replaced; 61 percent say it should be kept and fixed instead. Even more broadly, the public by 79-13 percent says Trump should seek to make the current law work as well as possible, not to make it fail as soon as possible, a strategy he�s suggested. Word is that the GOP is preparing to roll out a "new" program to replace ObamaCare. Stay tuned for updates.